Mrs Mac, our senior midday supervisor, has recently celebrated 31 years of service to our school. She was recognised by Surrey County Council this year and received a long service award. 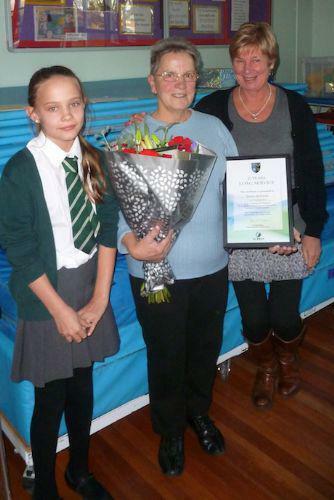 She was also invited to a special school assembly to celebrate her dedication and long service where she was presented with a bouquet of flowers. She pointed out that she had been a dinner supervisor to many of the parents who had children at the school today. We understand Mrs. Mac has no intention of retiring and we all wish her well with her continued outstanding service at MGJ.